Combine ingredients in bowl except for the wrapper. Mix well. Let sit in the ref for a few minutes before wrapping. This would allow the flavors to develop and for easy wrapping. Take a dumpling wrapper and put a tsp of filling in the middle. Wipe the edges with some water and fold over. Pinch the edges making sure they adhere. Crimp the edges for a pretty presentation when they cook. Some of the dumplings done. Heat some cooking oil in a pan. Mix a dash of sesame oil in it and start to brown the bottom of your dumplings. After browning pour in about 1/2 cup of water. Lower the heat, cover and let steam. You can add more water in case it dried out fast and d dumpling still not done. Steaming would take about 10 minutes. Just combine everything in a bowl. Adjust seasoning according to your taste. 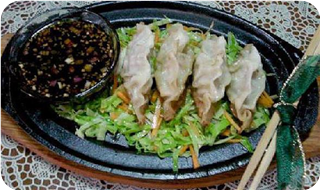 Serve together with your pot stickers and enjoy!